I’ll start this post off by admitting that this was not what I was writing. Oh, the general subject remains the same, but actions, reactions, and sentiments awakened can make things do a sweet 180 at times. 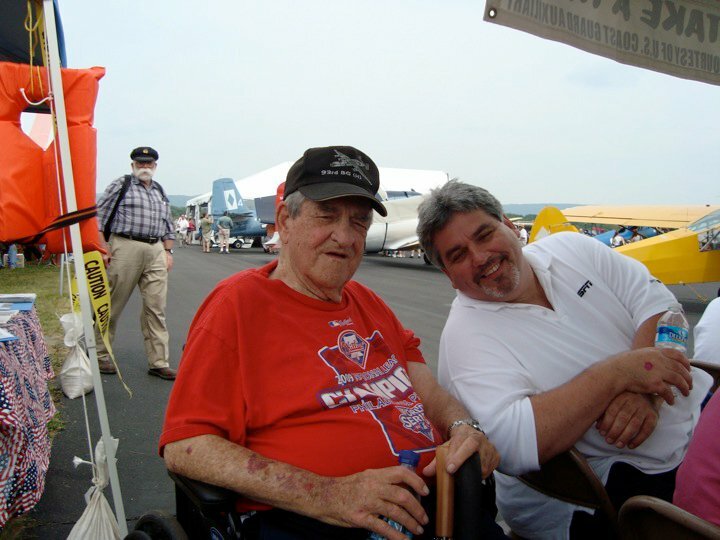 This past Sunday, January 15th, was the 1st Anniversary of the passing of my father. I’ve chronicled his illness and hospital stay in previous posts. I’ve also chronicled the impact it has had on me as I battle my ILD, my progressive lung disease. His passing refocused my own future (health and life) in a way that I am still figuring out. 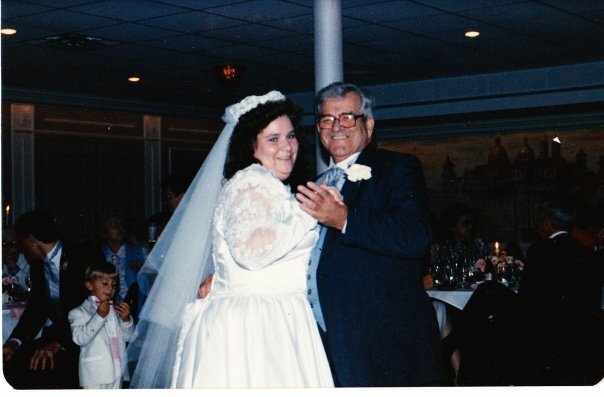 However, this was the last special date in a long year of melancholy firsts, coming to terms with the missing spot at the dinner table, the chair in the living room, the passenger seat in my car, the empty booth at the diner that Dad loved. The missing presents under the tree, the missing buddy to watch the Phillies, Eagles, Sixers, and Flyers, the gentle voice quietly singing along to his favorite songs. The man who I had hoped would still be there for me as my disease progressed. This was the 1st Anniversary of his passing and therefore, it brought a year of reflection to a close. The year closed, but not without coincidence. It is just those coincidences that caused me to hold the post I was writing and start anew. Basically, I was closing out a tough year, but Dad would have none of it. To begin with, the previous Friday, we went to my brother’s house to celebrate my niece Lauren’s birthday. My brother Joe always has a full house of friends and family for these events and my sister-in-law Richarda makes sure that their plates are full of good food as well. My dad loved to go to these things because he would see kids, kids that he would love to be Grandfather to. My dad normally sat in the corner of the couch, his dad belly protruding like a ledge and his white sneakers stretched out on the floor. Because he was older, he was served by others in the living room. This night, I was sitting at the end of the room and saw Lauren bring a piece of birthday cake in to give to the man with the white sneakers. I thought to myself that I hope Dad likes this cake. I then realized that it wasn’t Dad on the couch, it couldn’t be. My sister Julie and my sister-in-law both had similar experiences that night. It was then that we realized that, as I said above, Dad loved these parties and he had no intention of letting the afterlife keep him from sharing birthday cake with loved ones. Then, on Saturday, I stumbled upon a couple of DVD’s that I had burned years ago from our old VHS tapes of our trips to Disney World. The DVD I picked up was shot in 1989, and was of our family at the HOOP-DEE-DOO REVUE at Fort Wilderness as well as on the carousel in Fantasyland. My dad loved these trips, but this particular trip was even sweeter for him because my sister Julie and her daughter (my niece) Julle came along. Little Julie was around 3 years old and was having a grand time hooting and hollering. 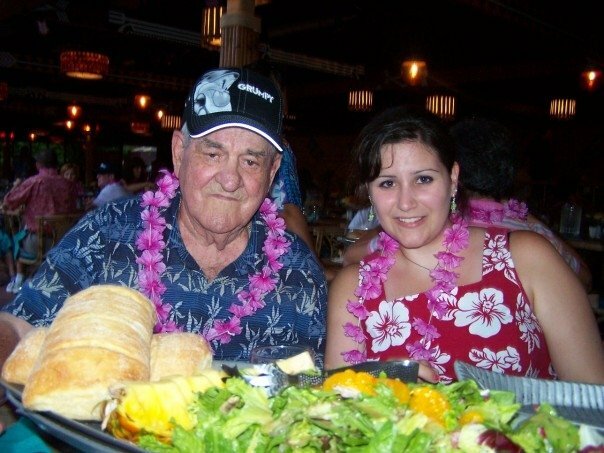 Now grown up, Julie is planning her wedding to take place in Disney World (Like PopPop, like niece). 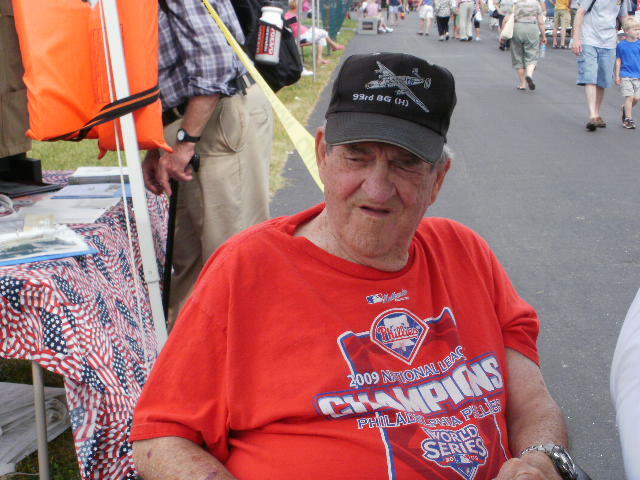 The planning has been going on for a couple of weeks, and it has always been in the back of our minds that Dad would not be able to attend something he had always dreamed about. He loves Little Julie, called her PUMPKIN. 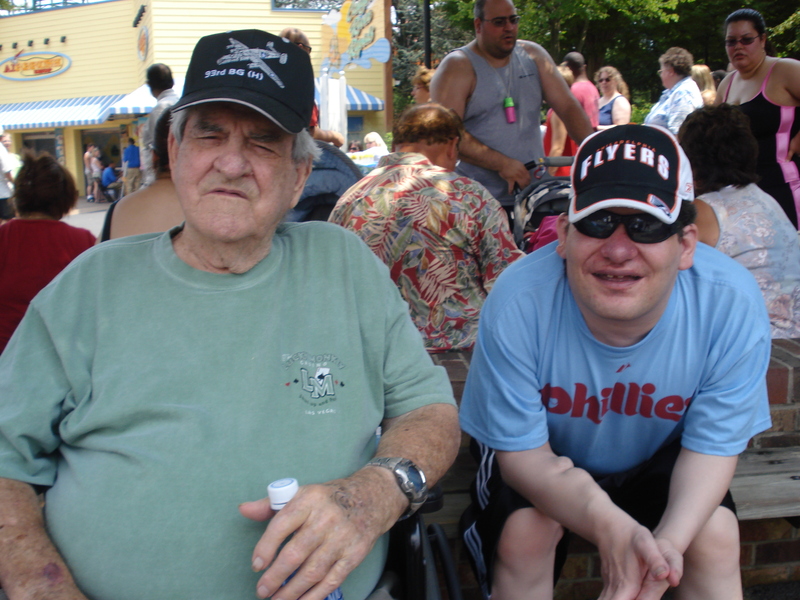 As we watched the carousel on the DVD, we were pleasantly surprised and deeply moved to see Dad, all smiles and wearing his ever-present cap. He was doing what he loved, helping his grandkids have a great time, in this case, holding onto Little Julie as she heads around the merry-go-round. The pure expression of happiness on his face and the excitement on hers were what Dad lived for. 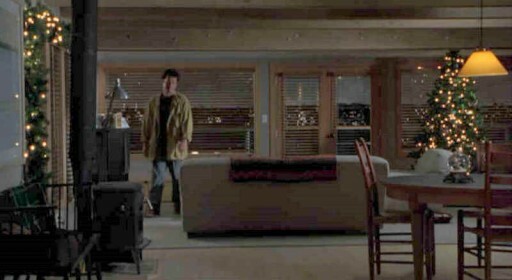 And by guiding us to the long forgotten DVD, he was telling us he will be right there with Julie on her wedding day. Sunday was the anniversary, and my sister Julie and my brothers Tommy and Joe went with me up to my Dad’s gravesite in Morris Cemetery in Phoenixville, PA to reflect on this day. My brother Joe drove up separately and we met at the cemetery. 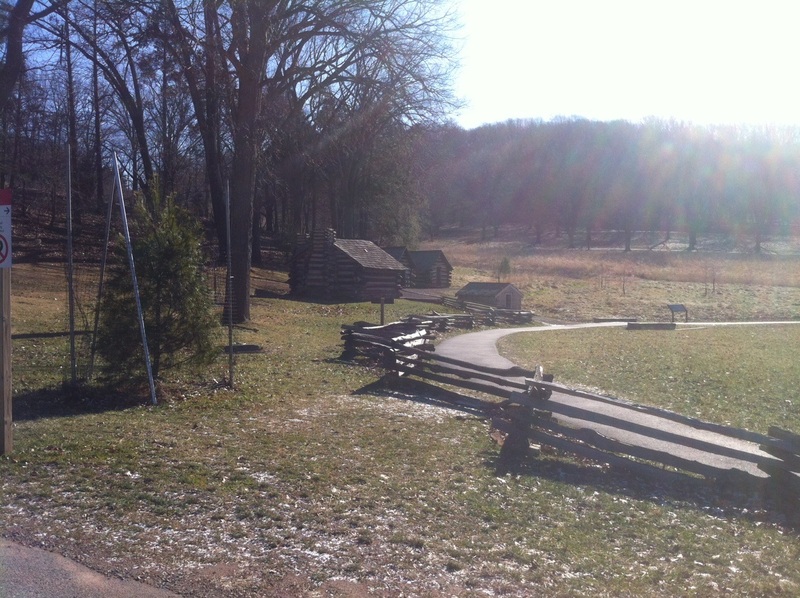 We were going to meet at a certain time, but as I approached Valley Forge, Joe informed us that he was running late. Julie, Tom, and I had time to kill, and were not sure what to do. So, I did what my dad would do. I made the next left off of Route 23 and proceeded to drive through Valley Forge. Now, I’ve taken Rt 23 plenty of times over the years, but mostly as a way to get to or from Phoenixville. It had been many years since I explored the actual park roads. As we drove along, we saw things we had not seen in a long time, cannons that I was sure I had posed on as a kid, hills and fields I had run along, and views that my eyes had not viewed for years. We then came upon a familiar open area and realized to much delight that it was the picnic field that we used to go to almost every Sunday when we were kids. We could see the hills we would climb, the trees we would sit under, the field we would play ball or chase games on, and where we would spread the blankets and pop open some semi-frozen cans of grape soda. So many memories came rushing back, and I wanted to stay, but we had no picnic basket so we moved on. We then went and drove over to Washington’s Headquarters to kill a few more minutes, again doing just as Dad would do, meander around and see the view from the car without a set schedule or route. We drove and we had a great time doing it. One place that I had not seen before is pictured below. 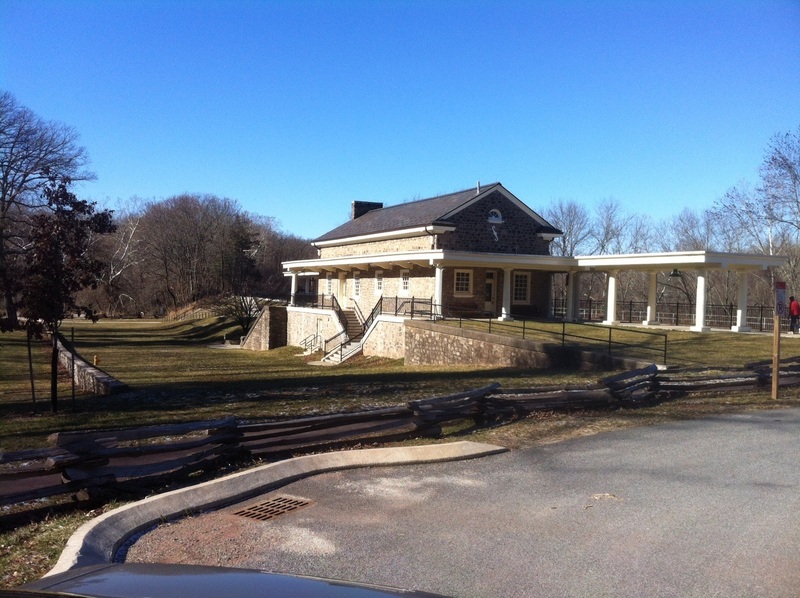 This is a beautiful train station hard by the banks of the Schuykill River near the Headquarters. The train tracks are used by freight but the refurbished station looks like part of an extended commuter rail plan. I need to check that out, but leave it to Dad to show us something new as we did what we loved. 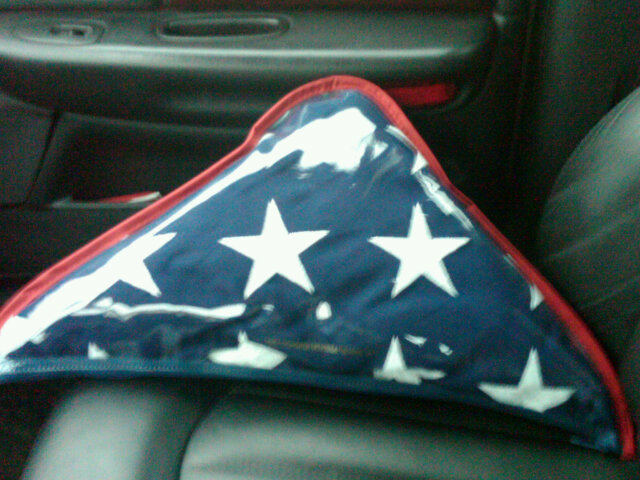 We then headed to the gravesite and sat there for about ten minutes before my brother Joe showed up. The day was cold and the wind was raw but it really hadn’t bothered us all day. We got out to see my Dad, with my Mom and my brother JP on either side of him. It was sad and reflective. However, as we stood there, the wind picked up and the cold felt unbearable. I went back to my car to get a cap and even that didn’t help. We decided it was too cold to stand around. It was almost as if, just as he guided us to fun places we had shared, my Dad was telling us to move along, to get back to life. 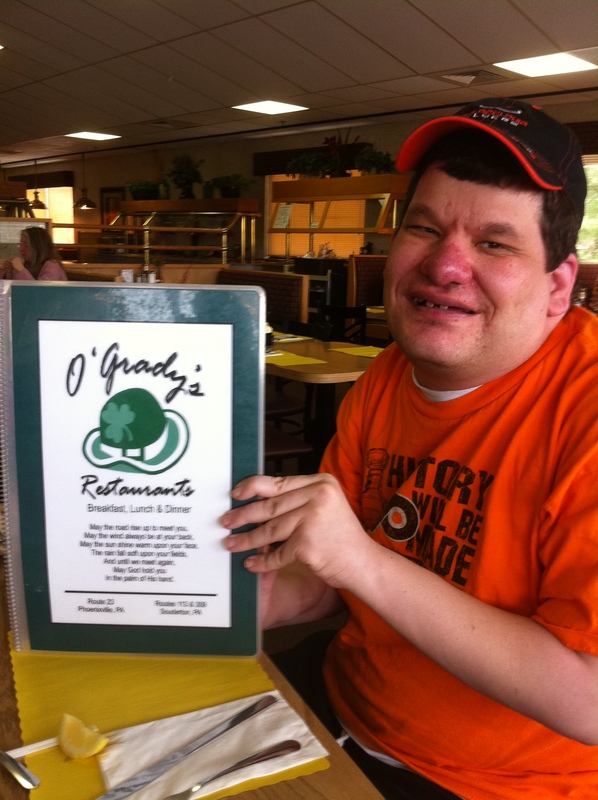 We then traveled to my Dad’s favorite restaurant in Phoenixville, O’Gradys. He loved their breakfast bar. He also loved fried oysters and they had them. Joe, Julie, Tommy, and I had a good meal and Tommy flirted with all the waitresses. All of the above seems ordinary until I started to think about it on the way home. As with my nieces birthday party, and with Julies wedding planning, what we thought we would do was changed. It was obvious that my Dad did not want us to spend the weekend sad. He simply wanted us to spend the weekend with him. He guided us to memories, he showed us the happiness again and he made sure we stopped and enjoyed what we had always enjoyed as a family. He wanted to do these things again and he took us with him just as he did when he was the driver and we were the kids. That will never change. The day was supposed to be a memorial to my Dad on the one year anniversary of his passing. It turned out to be the best picnic day we had ever had. Thanks, Pop. Last Christmas season was a very tough on for me. 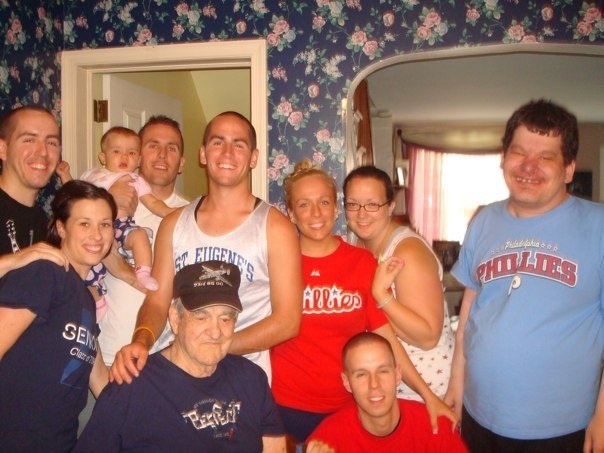 Besides being the first Christmas dealing with my pulmonary disease unknowns, it was also the last Christmas season that we got to spend with my Dad. 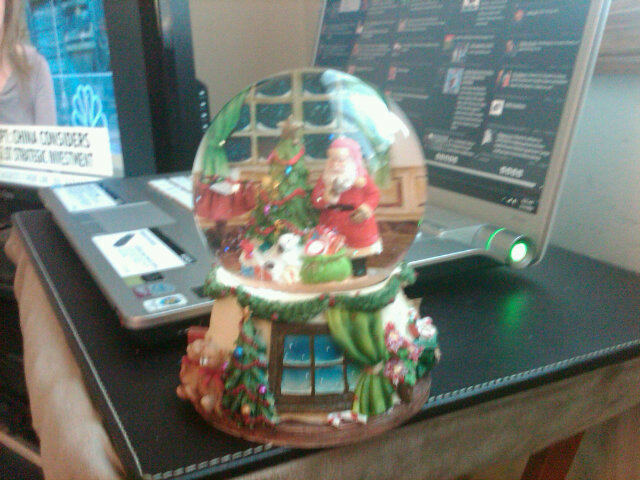 On Nov. 30th, I bought my father a Christmas snow globe to place by his chair for a little holiday spirit. (That’s it to the left). I had picked it up from a Rite Aid on impulse while picking up other items. We did not do a lot of decorating at the apartment because Dad was afraid of damaging the windows or walls hanging lights. 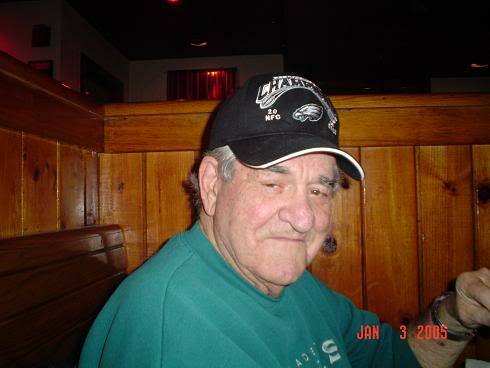 After watching a Sixers game with him, I gave Dad his night pills and got him to go in to sleep for the night. Little did I know that he would bring himself back out around 11 PM to do something that he wasn’t supposed to do: he decided that he had to put clothes in the dryer that night. Our dryer had a lint screen that had a little “bump” to keep it in place, but also required a good tug to remove it to clean it. He gave it that stubborn tug and lost balance, falling backwards and slamming his head into a door jam, creating a huge lump. He still had consciousness, and was only worried about a quarter that he had dropped. It fell by the door to my bedroom. He used the quarter to scratch his lottery tickets that he always dreamed he would win big on. 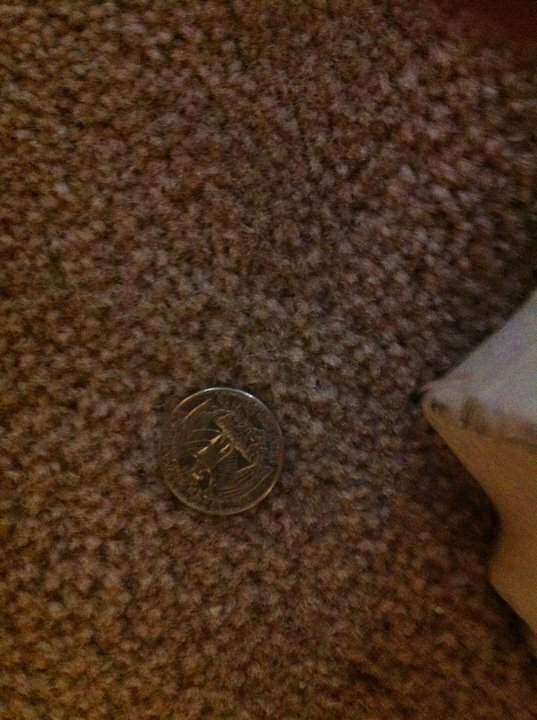 I left the quarter right where he dropped it and it was the last thing that was removed from the apartment when I moved Tommy and myself out to my sisters. I drove my Dad to the hospital while my brother Joe took my brother Tommy to my sisters and then joined me at the hospital. On the way to the hospital, I put B-101 on the radio, since they were playing Christmas songs. My dad sang along the entire 20 minute ride to Lankenau Hospital’s emergency room. My dad never returned home. 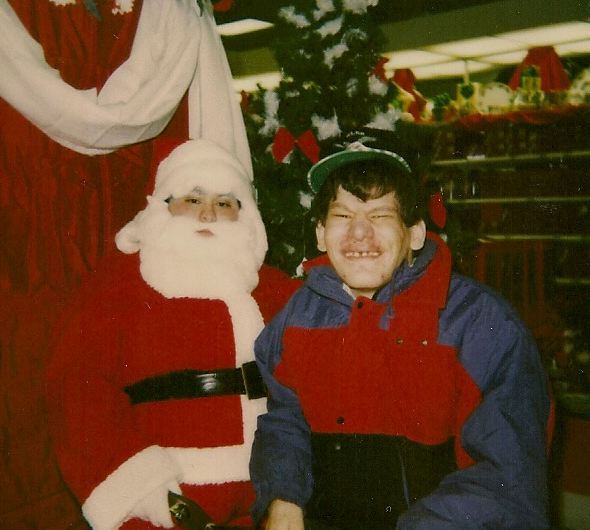 He spent the entire Christmas season in the hospital in increasingly failing condition. He passed 7 weeks later. So, with your indulgence, I’d like to share some of my Father’s Christmas favorites with you. Dad was a real sentimentalist for the holidays. First of all, he started looking for Christmas films on TV the beginning of October, really annoyed that he had to wait. He loved the classics, but ever since my mother passed in 1994, he especially loved to watch holiday films that either reminded him of her or gave him a good cry of remembrance for her. He loved SLEEPLESS IN SEATTLE because Tom Hank’s character shared the same feeling of loss that my Dad did. While not necessarily a Christmas film, the film does have a lot of action set during the holiday season. 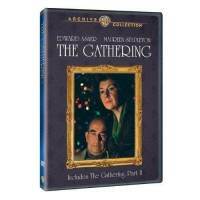 He also loved a TV film starring ED ASNER AND MAUREEN STAPLETON called “THE GATHERING” . 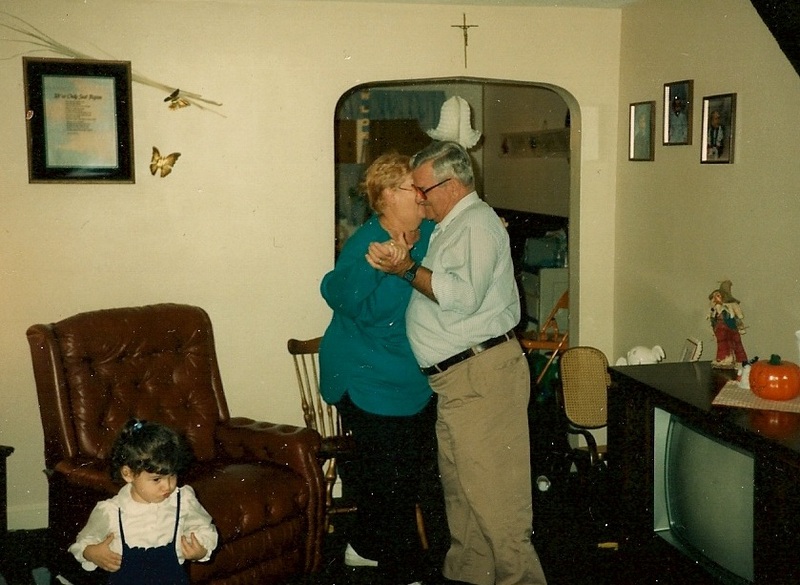 This was the story of a family patriarch whose family is falling apart. He is separated from his wife, his kids are strangers, and one has run to Canada as a draft-dodger. When he is confronted with his own mortality and is told he does not have long to live, he decides that he needs to get his entire family back together for one last Christmas. 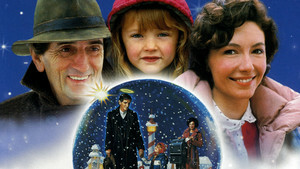 Another favorite was a film called “ONE MAGIC CHRISTMAS”. This is a “Wonderful Life” style story of hopelessness and redemption, complete with Harry Dean Stanton as an harmonica playing angel. The story is about a woman who has lost the spirit of Christmas and the spirit of living each day. She struggles to feed and provide for her family in a depressed town. An accident that might have been set in motion by an small action earlier leads to the death of her husband and her descent into “George Bailey” territory. And my dad loved his Christmas songs. They usually had a traditional or country flavor and you better not fool around with the arrangements. He also loved classical and religious carols, because they reminded him of my mother, who had a tremendous operatic voice. You knew that he liked it when you heard him quietly singing along. 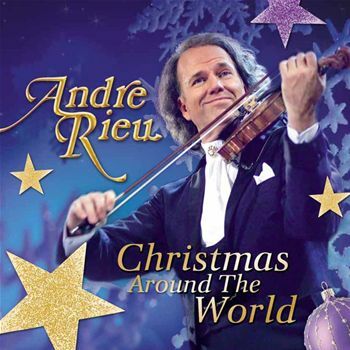 His big music thrill over the holidays was always the Andre Rieu holiday concerts on PBS. Andre Rieu is a new style classicist who plays violin and leads a Viennese orchestra. I took my dad to see him a couple of times. He also loved his country Christmas songs. 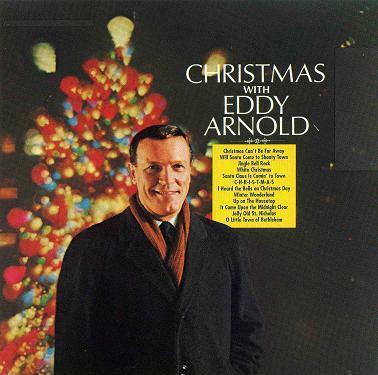 Eddy Arnold was one of his favorites. And he loved the Ave Maria, because my mother could sing the heavens out of it. 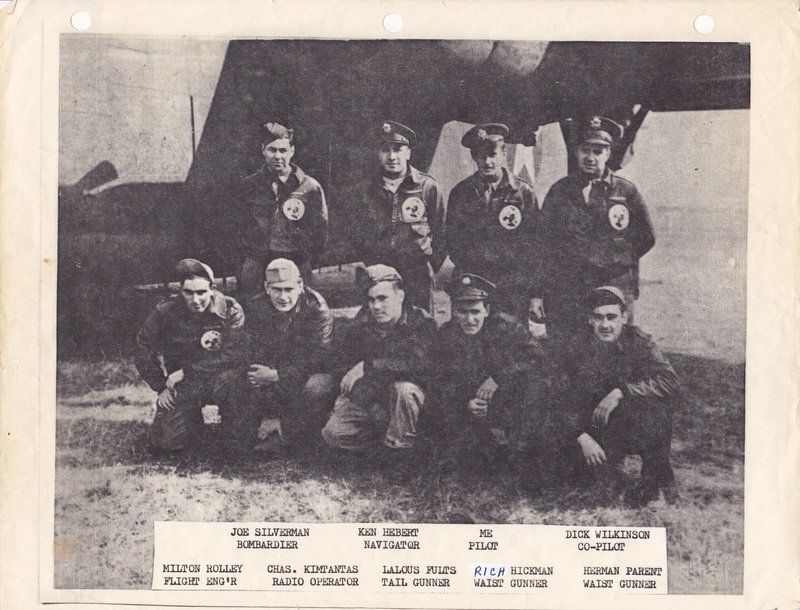 This is my father's B24 Liberator Flight Crew. 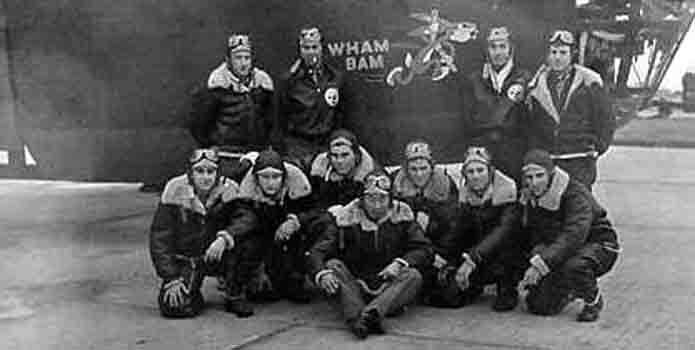 He is front row, second from right. 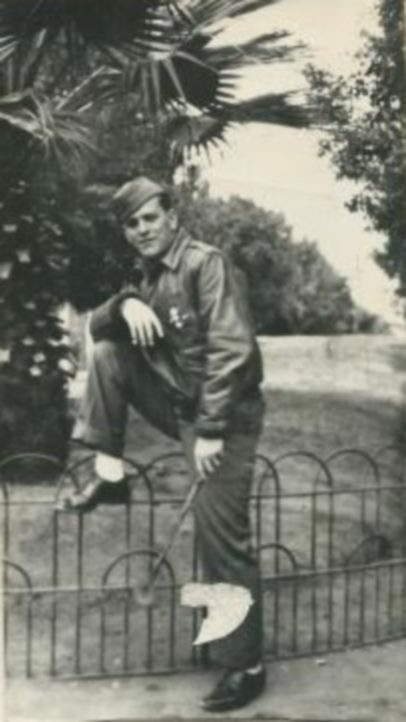 On this Veterans Day 2011, I want to take a moment to salute my Dad, who passed away on January 15th of this year. 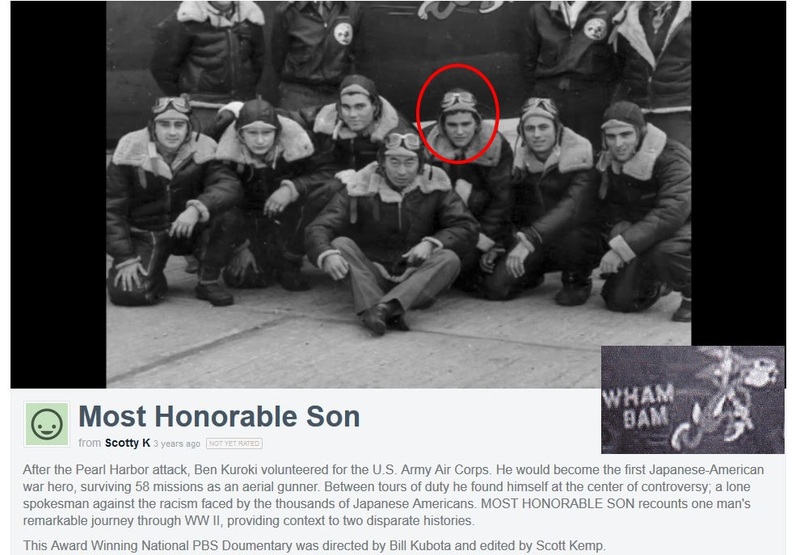 Today is the first Veterans Day in a long time that he can once again celebrate with the rest of his flight crew. I hope they are having a great time up in Heaven. Down on earth, I am remembering my hero. 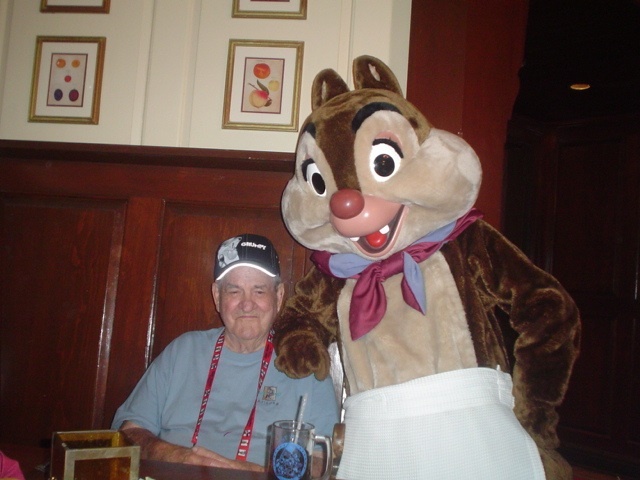 The links below will take you to some previous postings about my dad. Feel free to read them and comment, or just use them to remember the veterans in your own family, and all the brave US military, living or deceased, who have given of their selves so that we remain safe.